Reliance Jio Phone Pre-Booking: The JioPhone smart feature phone launched by Reliance Jio has officially started shipping. Some customers have already got the phone, while some are yet to receive it. Several media reports claim that About 6 million Jio Phone units were booked in a day and a half when the company opened bookings of the 4G feature phone to the public on August 24 in the first phase. But, the company hasn’t confirmed the numbers yet. People who not booked the Jio Phone are eagerly waiting for the second phase. Here is good news for those eagerly waiting to book Jio Phone. “The second phase of Jio Phone booking will start after Diwali. Likely from October-end or November first week,” a Reliance Retail channel partner said, PTI reported. However, Reliance Jio is yet to roll out an official statement on the same. Some of them have already received their Jio Phone. While others are expected to receive it by Diwali as stated by several media reports. Those who have already pre-booked the device can track their delivery status. There are three ways to track the delivery status of your device. You can track it via the official website: On the company’s website go to the track order page and enter the order number to know the latest update on your device. Or Download MyJio app, if you haven’t already, and using your registered number log into the application. Users can track their respective orders from within the application. The buyer can also contact 18008908900 for more details regarding their delivery date for Jio Phone. Jio Phone was booked with Rs 500. At the time of delivery, the customer needs to pay Rs 1,000. They also need to produce some documents like – JioPhone order number, the receipt that they must have received while booking the phone, and their Aadhaar details. The company will also send updates regarding the device on the registered mobile number once it becomes available at a Jio store near you. 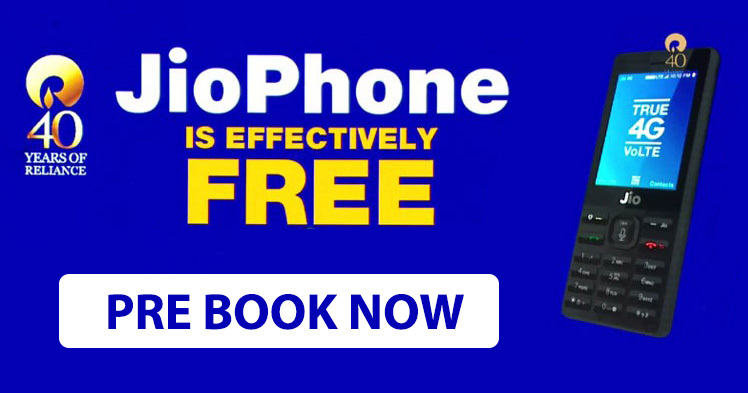 To recall, Reliance Industries Chairman and Managing Director Mukesh Ambani had announced that the 4G phone will be “effectively free” for users, but to prevent misuse of the scheme JioPhone buyers will need to pay a one-time fully refundable deposit of Rs 1,500. Reliance Jio’s terms and conditions for the Jio Phone, users will need to recharge for a minimum of 125 per month or Rs 1,500 per annum for a period of three years to be able to claim a refund of their Rs 1,500 deposit.